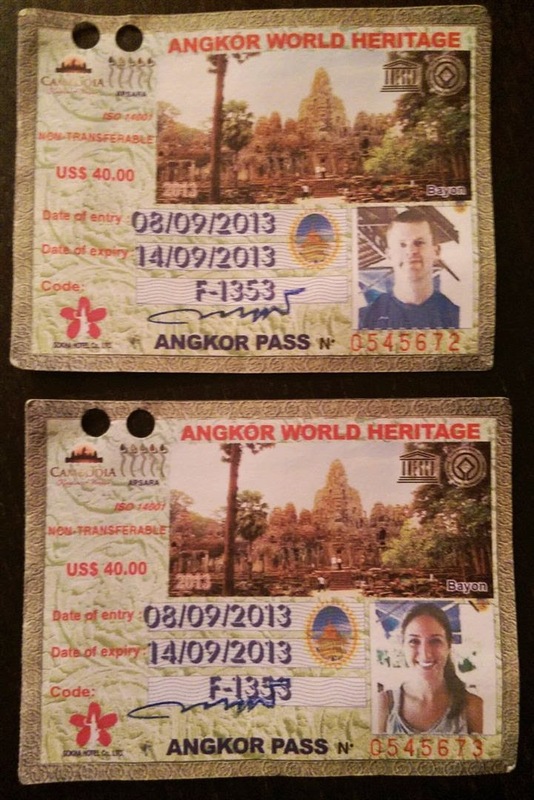 Our first full day of our trip, (Sept. 8, 2013) and we were on another flight to Siem Reap, Cambodia! 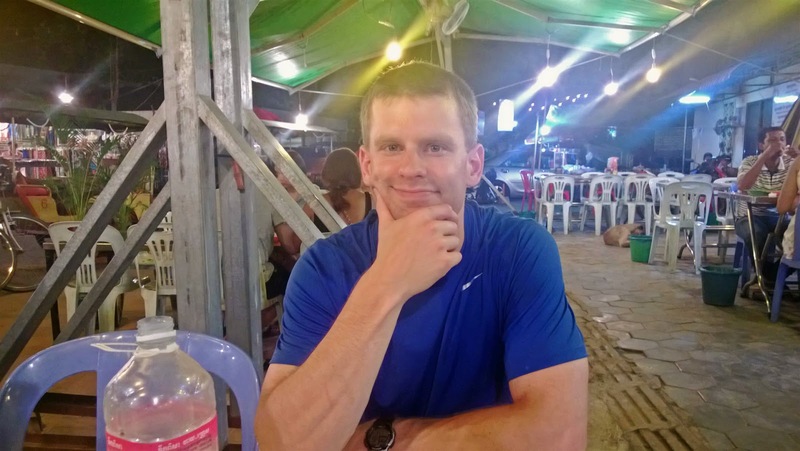 When we first planned this trip, Thailand was the main place we wanted to go, and then when we realized we could get over to the see ancient temples in Cambodia fairly easily, we decided 'why not?!' So glad we did! I read that getting into Cambodia was best done by flights and the bus/train from Bangkok to Siem Reap is long and the road is pretty sketchy. 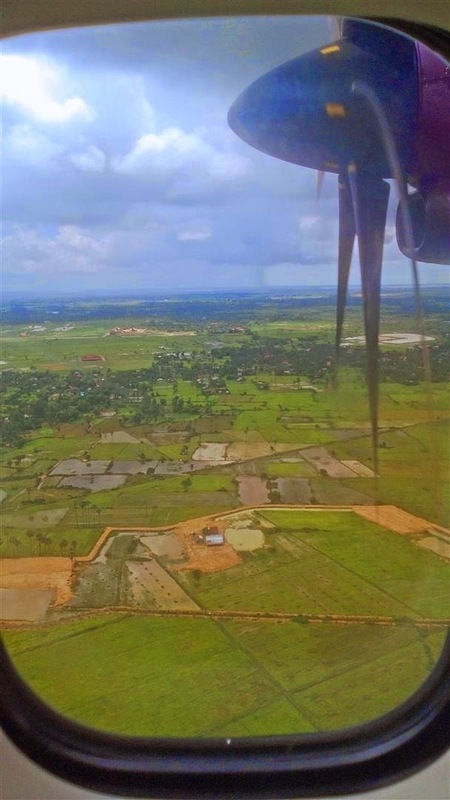 So we decided it best to pay the premium and fly into Siem Reap rather than risk it. After an amazing sleep we woke up pretty rested, had breakfast at our hotel and then at about 8 a.m. we were heading back to the airport for yet more planes! 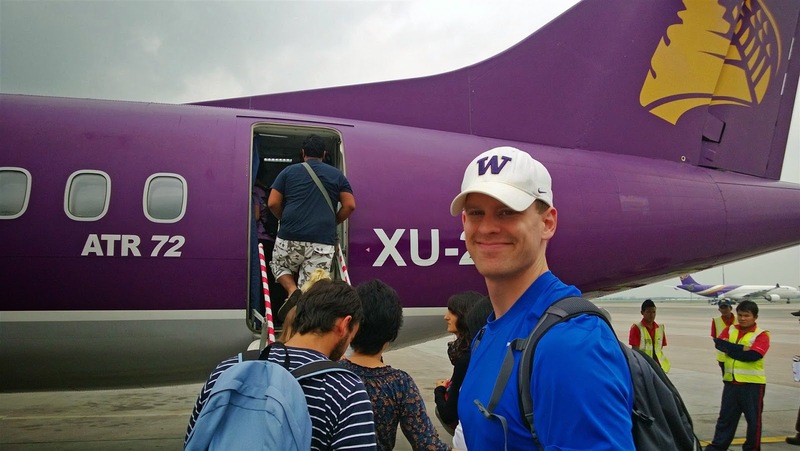 Our plane was a small one - I'm not a nervous flyer, but flying in on a two-prop plane into Cambodia did make me just a tiny bit nervous. After clearing immigration and customs, we headed out the door to find my name on a sign. Our airport pickup was a tuk-tuk! 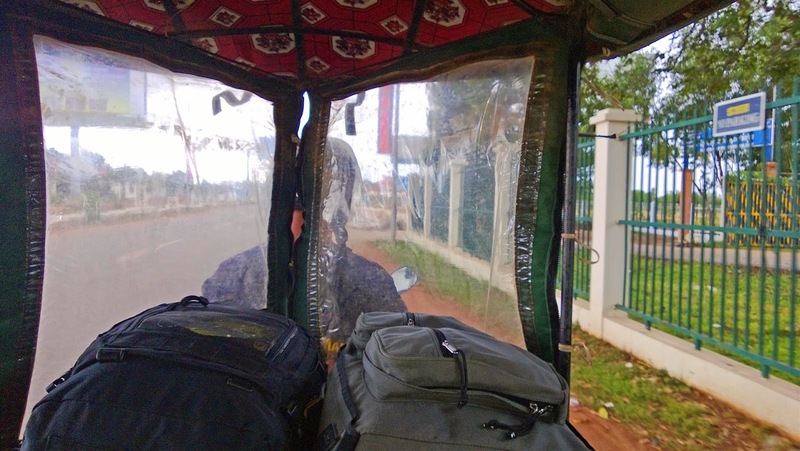 We had read that the time of year we were travelling we would probably experience periods of monsoon rains, and during our tuk-tuk ride - we did! The skies opened up and it poured like no rain I have ever seen in my life. Their rain is heavy, but only lasts about a small amount of time - about 10 minutes or so. Luckily we stayed dry in our tuk-tuk! We checked into our hotel - everyone was SO friendly, went upstairs and dropped off our bags, changed and got a call that our guide was here! 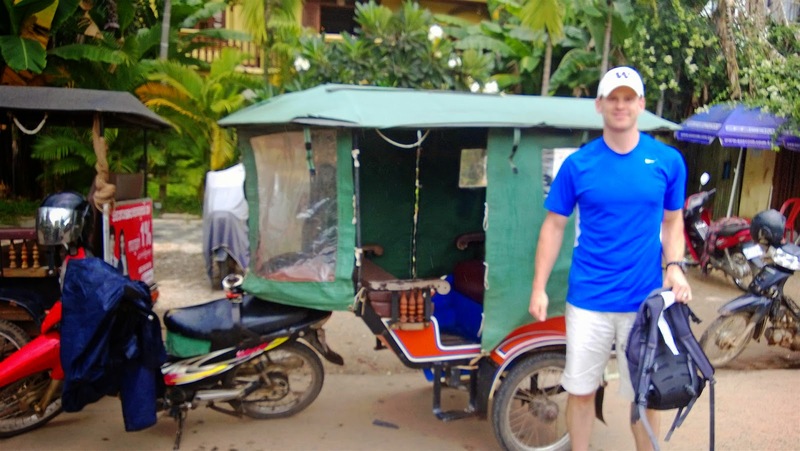 When doing research on Siem Reap and the temples - I decided to book a private guide with an air-conditioned car, rather than try to manage the temples on our own. I am so glad we did it this way. 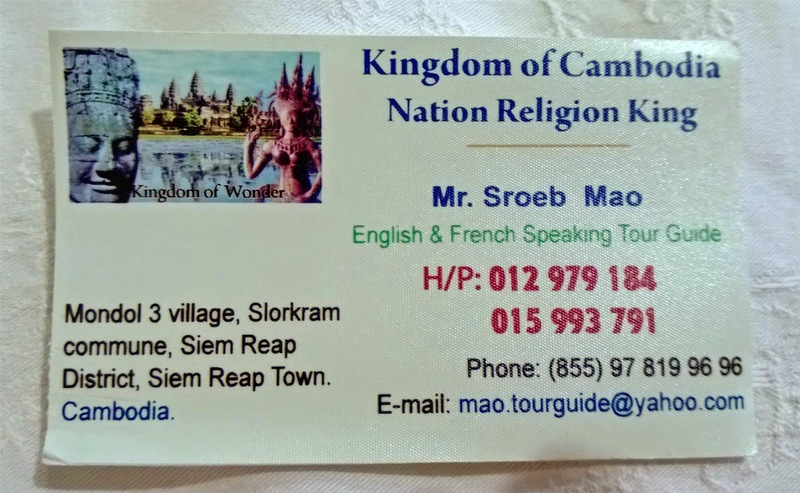 Our guide was Mr. Sroeb Mao (goes by Mao) and he was fantastic. His knowlege of the temples was amazing, and he was a great picture taker too - I highly recommend him! Here are some maps to show just how large the temples are. We were pretty blown away. We hopped in the car (the downpour had stopped) and were off to buy our tickets! We got a three-day pass because it was thh same price as buying two single days. Getting into the park is very strict and Mao said they have controllers and checkpoints around the parks to make sure that no one sneaks in. Our first stop was Angkor Thom and headed straight for the main temple in the center, the Bayon. This one is full of smiling Buddha faces carved into the walls. Mao showed us the area where you can "kiss" Buddha. Much of the rest of the day was a whirlwind tour through the rest of Angkor Thom. It's 3km on each side, so there's a lot to see inside. 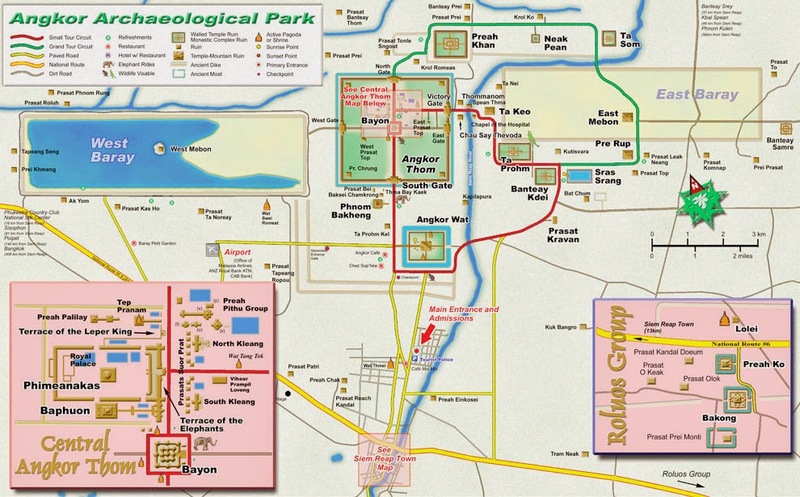 We went through the Baphuon, then the Phimeanakas - the royal palace, most of which has actually burned down, though the walls and some major architectural structures like pools remain. Heading north to Preah Palilay (the "kneeling elephant" temple, then east to Tep Pranam, then south past the Terrace of the Leper King and Terrace of the Elephants (with an explanation of the "stadium" it faced out onto, we arrived back at the car. From there, we drove to Phnom Bakheng to see the sunset. There was a great view here of Angkor Wat in the distance. Lots of people race up here to see the sunset, as they close at 5:30 to avoid letting too many people in but the sun doesn't set for another 30 minutes or so after that. It's a bit of a hike up the hill with some steep stairs at the end - the photo op is at the top of a temple - but it's well worth it. We were dropped off at the hotel at about 7 p.m. and even after a busy day were doing okay with jetlag, so ventured out to find food. Our hotel told us that Siem Reap is very safe and we can walk outside alone. We walked to the night market area, about 15 minutes from the hotel. 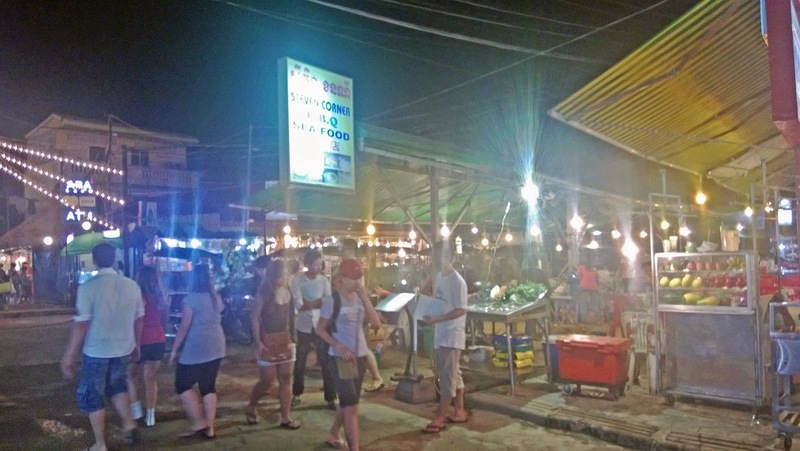 We ate dinner at a little restaurant just outside the market and it was yummy - Cambodia food is good! It was just a little street restaurant, but yummy. And only bottled water of course! We got back to the hotel and went to sleep just after 9 p.m. and passed out! We had an early morning the next day - more Angkor temple touring in and a sunrise wakeup call! Yayyy, you're blogging again! I've missed your posts and this is the perfect catch up. I LOVE all of these pictures and your awesome advice. I definitely need more travel in my life, and your posts never stop inspiring me to go on and travel even more! Seriously, these pictures are stunning - I was jealous of this trip for a while, and this just solidifies the extent of it :) You look so beautiful, you and Nick look so happy, and I seriously love that the two of you do so much and travel so many amazing and unique places together! I hope you had a gorgeous Christmas, beautiful friend! Let's try to chat more in 2015 (and hopefully plan a trip - Anthony and I are talking West Coast, so I'm totally going to push to make it happen!). I so traveled through your travel posts. :) You guys looked happy. Love you got to see and do so much. Happy 2015, may this year be amazing for you and Nick and filled with more travels and exciting adventures!!! Wow, what an amazing day out! I've only been to South East Asia once, to Singapore for a stopover to Australia. I would absolutely love to see these temples and really enjoyed seeing it all through your eyes. Just gorgeous. The highlights from my life in Seattle! I love to travel, cook, be outside, experience new things and discovering the everyday delights of life.